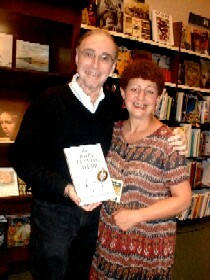 It was reunion time for Jeanie Cogan and Bob when he made his third annual visit to the Barnes & Noble location in Encino, CA. The October 9 date coincided with what would have been John Lennon's 61st birthday, which added a special wistful note to the occasion, even though it came a few days after The John Lennon Affair made a much welcome appearance on the Los Angeles Times bestsellers list. 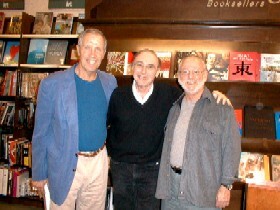 Among those who turned out for the event were Mitchell Geffen, left, who shared producer credits with Bob on some of the music shows Bob developed some years ago, and Jay Lowy, a two-time president of the National Academy of Recording Arts and Sciences, who headed the Jobete publishing arm of Motown Records. A side note: At the time of his murder, John was recording his new album for the label owned by Mitchell's brother, David. 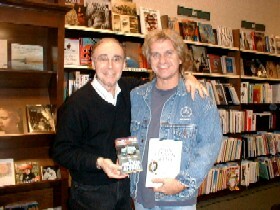 Bob and Kip Brown, who's devoted recent years to compiling a comprehensive day-by-day from birth-to-death-and-thereafter diary of James Dean, planned for publication sometime next year. 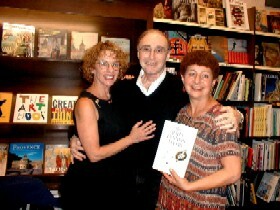 They met a year ago, when Bob was visiting stores in conjunction with his #1 Los Angeles Times bestseller, The James Dean Affair. Jeanie and Bob with Brenda Lowy, president of one of the nation's most successful manufacturers and marketers of sachet originals.